WASHINGTON — Drawing lessons from her critically acclaimed book, The Smartest Kids in the World, journalist Amanda Ripley told a group of graduating high school students that they should see themselves as part of a global competition when they head off to college in the fall. “It’s not this vague competition that may happen one day,” Ripley told several dozen graduating seniors at the inaugural “Cap & Gown” ceremony of Capital Partners for Education, a nonprofit college prep program that serves close to 200 students in the Washington metropolitan area. 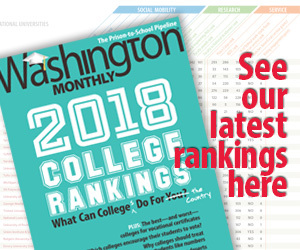 “It’s already happening,” Ripley said, noting that their college applications are being considered alongside those of students from educationally top-performing countries such as South Korea, a focal point of her book and the third largest sender of students to the U.S.
“One of the reasons it’s harder to get into an American university is because they are admitting more international students,” Ripley said, an assertion supported by statistics that show the percentage of international students in the U.S. reached a record high of 3.9 percent in the 2012-2013 academic year. Ripley urged the students not to be daunted by competition from abroad, even though the “kids from Korea” may be the ones who “determine the curve” in their biology class in college. “Instead of feeling intimidated by the competition, I suggest we say, ‘Bring it on,’ because all of you deserve to be in the arena and you are already,” Ripley said. Ripley made her remarks Monday at the National Press Club during an event meant to celebrate the achievements of students participating in CPE, which seeks to “level the playing field” by providing academic support and college-educated mentors to students from families of lesser economic means. Ripley hailed the organization for embodying the three things that she discovered were taking place in Poland, Finland and South Korea — the nations she visited to write The Smartest Kids in the World. â€¢ Students having a certain “comfort” with struggling to achieve academically. “All three of those things are things that this organization aspires to cultivate and that all of you have worked to develop,” Ripley said. Indeed, at the ceremony, it was easy to find students who embraced their academic struggles and caring adults who stepped in when students needed help. For instance, 18-year-old Nathan Tekola related how when he began to struggle in his geometry class toward the end of his junior year, he concluded that his teacher was “out to get” him and that he should switch schools. Tekola ended up getting an A in geometry and abandoned his plans to switch schools. Now, Tekola is headed to Frostburg State University, where he plans to study biochemistry. Khari Brown, executive director at CPE, said more than 70 percent of CPE graduates complete college — several times what research has found to be the rate of 9 percent for the lowest-income students, and higher than the national average of 57.2 percent, according to federal data. Brown said CPE helps students develop a sense of agency as they navigate the world of higher education. He said the work of college prep organizations such as CPE is important because if students drop out of college, it will leave them saddled with debt and unable to get good jobs. “We need to prepare the next generation of leaders to be able to compete nationally,” Brown said.